The high choir of Cologne Cathedral (1248–1322) is considered one of the finest Rayonnant structures of the Middle Ages. In French Gothic architecture, Rayonnant (French pronunciation: ​[ʁɛjɔnɑ̃]) was the period between c. 1240 and 1350, characterized by a shift in focus away from the High Gothic mode of utilizing great scale and spatial rationalism (such as with buildings like Chartres Cathedral or the nave of Amiens Cathedral) towards a greater concern for two dimensional surfaces and the repetition of decorative motifs at different scales. After the mid-14th century, Rayonnant gradually evolved into the Late Gothic Flamboyant style, although the point of transition is not clearly defined. Although elements of the new style can be found at the Cistercian abbey church of Royaumont (begun 1228, now mostly destroyed), perhaps the most important step in the development of the Rayonnant style was the building of the Abbey Church of St Nicaise, in Reims (begun 1231). Although this church was entirely destroyed during the French Revolution, its facade is well known from 18th-century engravings. The architect (Hugues Libergier) took various existing elements of the Gothic decorative vocabulary and used them to create a very new visual aesthetic. Perhaps the most influential feature of the Church of St Nicaise was its west facade, constructed as a series of pointed gables decorated with crockets and a mixture of blind and open tracery, interspersed with narrow pinnacles. Unlike earlier Gothic west facades, with their clear three-part horizontal and vertical divisions, Libergier's design was more screen-like (indeed it may have been inspired by earlier choir screens) and on a far more human scale than the cavernous doorways of Reims Cathedral. Several key elements of the St Nicaise facade were soon taken up by other architects and can be recognised, for example, in the treatment of the North transept portal of Notre Dame de Paris and around the roof line of the Sainte Chapelle. Whilst all phases of Gothic architecture were concerned to some degree with levels of illumination and the appearance of structural lightness, Rayonnant takes this to the extreme. More of the wall surface than ever before was pierced by windows (see for example the Sainte-Chapelle in Paris) and buildings were often given lace-like tracery screens on the exterior to hide the bulk of load bearing wall elements and buttresses (such as at Strasbourg Cathedral or the Church of St Urbain, Troyes). 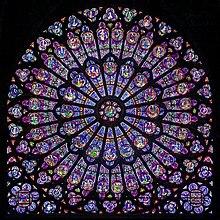 As well as increasing the size of window openings, the Rayonnant period coincided with the development of the band window, in which a central strip of richly coloured stained glass is positioned between upper and lower bands of clear or grisaille glass, which allowed even more light to flood in. Although changes in window design are the most oft-cited feature of the Rayonnant style, they were actually just one part of a more fundamental aesthetic shift. The key precursor was a change in the construction of window tracery; the replacement of old-fashioned plate-tracery (in which the window openings look as if they have been punched out of a flat stone plate) with the more delicate bar-tracery (in which the stone elements separating the glazing panels within a window are constructed out of narrow carved mouldings, with rounded inner and outer profiles). Bar-tracery probably made its first appearance in the clerestory windows at Reims Cathedral and quickly spread across Europe. As well as being a more effective and flexible way of constructing windows, bar tracery also paved the way for the development of blind tracery (decorating an otherwise blank wall) and of open tracery, typically all using the same decorative motifs as the adjoining windows. The final architectural innovation that emerged as part of the Rayonnant style in France was the use of glazed triforia. Traditionally, the triforium of an Early or High Gothic cathedral was a dark horizontal band, usually housing a narrow passageway, that separated the top of the arcade from the clerestory. Although it made the interior darker, it was a necessary feature to accommodate the sloping lean-to roofs over the side aisles and chapels. The Rayonnant solution to this, as employed to brilliant effect in the 1230s nave of the Abbey Church of St Denis, was to use double-pitched roofs over the aisles, with hidden gutters to drain off the rain-water. This meant the outer wall of the triforioum passage could now be glazed, and the inner wall reduced to slender bar tracery. Architects also began to emphasise the linkage between triforium and clerestory by extending the central mullions from the windows of the latter in a continuous moulding running from the top of the windows down through the blind tracery of the triforium to the string course at the top of the arcading. Key elements of the Rayonnant style were incorporated into English architecture with the rebuilding of Westminster Abbey by King Henry III, who had been present at the consecration of Louis IX's Ste Chapelle. The resulting mixture of styles at Westminster (a crucial step in the development of English Decorated Gothic) has been characterised by some art historians as "French architecture with an English accent". Rayonnant was also very influential in the Holy Roman Empire, as evidenced by the cathedrals at Strasbourg, Cologne and Prague. In Spain we find the best examples in the León Cathedral and the Burgos cathedral, this last one quite modified in the time of Flamboyant Gothic. The style even reached as far as Cyprus (a French cultural outpost during the Middle Ages) with the most prominent example being Saint Nicholas's Cathedral in Famagusta. The various decorative elements employed in the Rayonnant style (bar tracery, blind and open tracery, gables and pinnacles) could also be applied on a much smaller scale, both for the micro-architectural fixtures and fittings within a church (tombs, shrines, pulpits, sacrament houses, etc.) and also for small portable objects like reliquaries, liturgical equipment, ivory diptychs, etc. This combination of flexibility and portability may have been a key factor in the dissemination of Rayonnant and its various offshoots across Europe in the late 13th and early 14th centuries. The transition (in France) from Rayonnant to Flamboyant Gothic was gradual and evolutionary in form, marked primarily by a shift towards new tracery patterns based on S-shaped curves (these curves resemble flickering flames, from which the new style got its name). However, amidst the chaos of the Hundred Years War and the various other misfortunes experienced by Europe during the 14th century, relatively little large scale construction occurred and certain elements of the Rayonnant style remained in vogue well into the next century. This page was last edited on 19 March 2019, at 10:18 (UTC).